Are you totally frustruated by today's disposable dating culture? Wondering how you can get past the third date and tired of being "ghosted"? Fed up with having your time wasted by men who have no intention of moving forward with you? After more than a decade of dating in New York City, I was so worn down and frustrated with the inability to find a partner that I decided to do something radical. I fled New York with the commitment to reclaim the sense of fun, adventure and wonder that I once had in meeting men. After traveling the world and dating men from Brooklyn to Budapest, I've uncovered quite a few truths about love and life. Join me as I take you on a journey into my experiences and then overlay them on top of your own to gain intuition into the blocks that may be holding you back from finding love. Learn how to avoid the red flags and pitfalls in the modern-day dating landscape and find peace on the path to The One. By strategically examining your patterns, asking yourself key questions, and using the law of attraction, you too can make your dating life meaningful and exciting again! First of all, the title is perfect. For me, it speaks to a deeper and higher purpose in the realm of ‘dating’ which almost by default has a superficial connotation. It sets the book up perfectly, to guide the reader into themselves, to grow spiritually as they are seeking meaningful romantic connection. The reference to adventure, brings to mind the excitement of a journey, we may not know where we are going, but we know its going to be amazing. And then you open the book and from the first page, the author’s sense of humor brings the relief of levity with each story and message. She shares her own experiences, and those she’s collected around her, to illuminate the darkness of the subconscious patterns that are driving our choices and relationships. Most importantly the relationship with ourself. 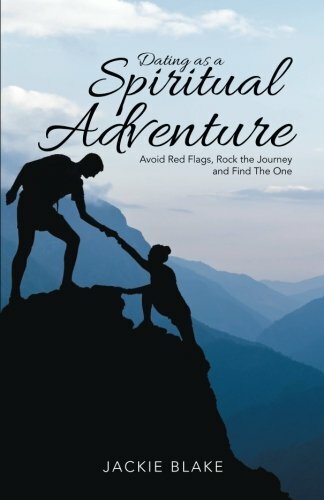 This book is SO much more than a dating guidebook or a traditional self-help book. Really, it’s a book that asks you to look deeper into your life, answer questions about your self-worth, beliefs, goals, and the people you invite into your life. It asks you to reflect on not only what you are doing in your romantic life, but also, what psychological or spiritual beliefs are tying you to those actions. This is the sort of book that really shaped the way I looked at dating, particularly with regards to what my motivating factors might be for choosing a partner. It really is, for lack of a better phrase, a game-changer. Also, I love the author’s conversational tone. Jackie Blake is easy to read, funny, and I feel like I can open up to any chapter or page and gather a nugget of wisdom for later use. As an avid reader of spiritual/self-help books, I must say, I found this book to be one of the most enjoyable ones that I’ve ever read because of Blake’s humor and tone. I loved the memoir-ish feel and would highly recommend this book. Jackie offers a humorous, thorough, clear, and generous voice throughout this book! There is something for EVERY woman in these chapters, as they are so true to everyday dating life. You will readily find yourself referencing Jackie’s lingo and applying it to your own situations - as well as dishing advice to your friends (women AND men) in a helpful way.